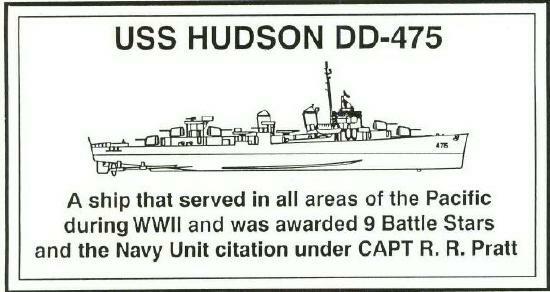 This plaque of USS Hudson DD475, as approved by those present at our 11th reunion Oct 19-22, 1999, at Washington, DC has been completed and ready to be placed on the wall at the Navy Memorial Foundation Museum in Washington DC. The date for the placement ceremony will be decided at our next reunion. This will give more members the opportunity to voice their opinion. This plaque is larger than the one at the Nimitz Museum in Fredricksburg, Texas. Both can be seen and appreciated by future generations. If anyone has a photo of the Nimitz Museum plaque, please email it to me together with all info you have on it.